Spent over $250,000 on total redo in 2000. Moving on Oct 1 and will take first $48,950 for quick sale. New Custom 200 gallon fuel tank; Teak cockpit and trim with custom built in stern fishwell; Custom teak swim platform and ladder; Northstar GPS; Furano Color recorder 600L and Lowrance sounder in lower station; VHF with booster to antenna; Forced air heater off engine for cabin and bridge total warmth in winter; New bridge canvase with double stregth stainless steel supports; Bridge has seperate from cabin station new hydrolic steering for safety; Full deck and bridge lighting; Lee 18 ft with spreader Outriggers; Rocket Launcher; 6 flush mounted rod holders; 12 rod holders over bunks for storage; Fuel flow meter; 3 bilge pumps; New batteries; New battery charger; Anchor Windless; Salt water washdown; Custom connector and full cusions to convert engine hatches to double bed; Dinette in cabin with lights and fans;Fighting chair(free standing)) and two side companion chairs; Refrigerator and freezer; 40 gallon fresh water tank and sink; hanging locker; electric toilet with Y through whole or tank; Full cockpit canvase and support tent for long term storage; Compolete fishing gear; 12 life jackets and ring; 2 fire estinguishers; Fishing 5 minutes from dock - so all engine hours are at dead slow trolling. 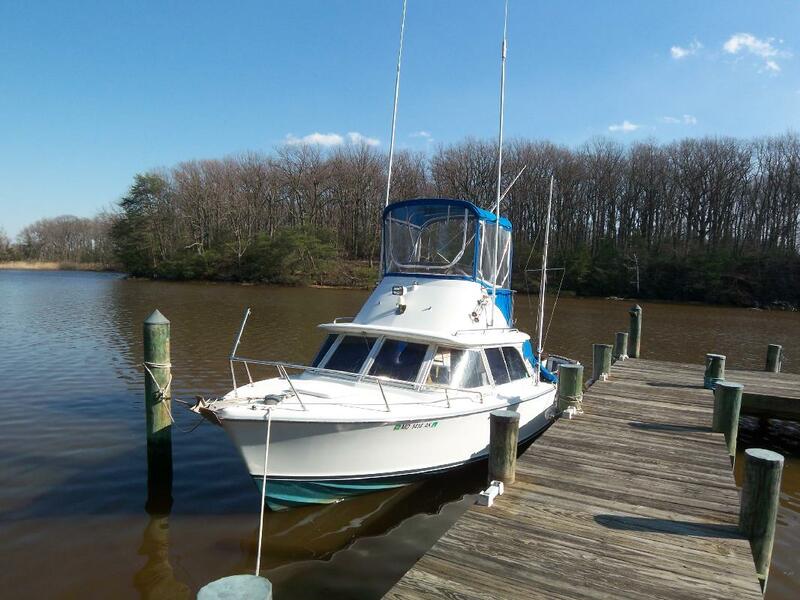 BOAT IN SUPER CONDITION - PROFESSIONALLY MAINTAINED - LOOKS NEW - EVERYTHING WORKS! MOVING - MAKE OFFER!! A great boat absolutely ready to go. Must sell as moving out of state.